Jenson Button, left, feels his McLaren team have the momentum to win this weekend's European Grand Prix. (CNN) -- World champion Jenson Button has warned his Formula One rivals that his in-form McLaren team are confident of securing a third successive victory at this weekend's European Grand Prix in Valencia. McLaren recorded a one-two finish at the last two races in Turkey and Canada, completing a dramatic turnaround in the overall standings. Button moved up to second place, three points behind McLaren team-mate Lewis Hamilton, with previous leader Mark Webber dropping to third ahead of Ferrari's Fernando Alonso and fellow Red Bull driver Sebastian Vettel. McLaren also lead the constructors' championship on 215 points, 22 ahead of second-placed Red Bull and 54 in front Ferrari in third. With a total of 25 corners, Valencia's Street Circuit is one of the most demanding on the Formula One calendar. 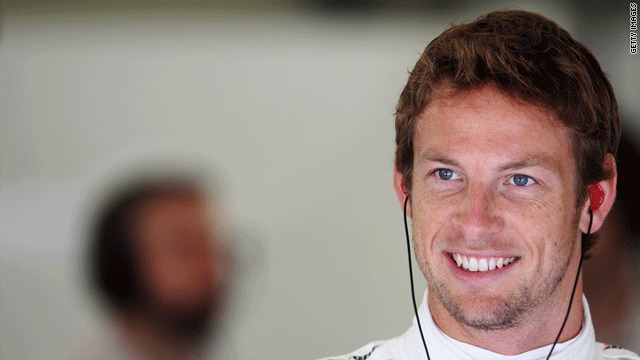 But Button feels there is no reason why McLaren cannot stretch their lead in Spain. "As a team, we've taken maximum points in the last two races and it feels like we've really gathered considerable momentum," the Englishman told Formula One's official website. "The team really is functioning as a single unit, so I think we head into Valencia hopeful of being able to once again capitalize on that determination and ambition." After a slow start to the season, Hamilton boosted his chances of regaining his 2008 world title after back-to-back victories in Canada and Turkey. The 25-year-old is now looking to win his first European Grand Prix after finishing runner-up in 2008 and 2009. "I'm really looking forward to racing in Valencia," he told reporters. "I had a great, attacking race there last year -- but I've finished second for the past two seasons, so I feel like I have some unfinished business!" Rubens Barrichello won last year's Valencia Grand Prix while driving for world champions Brawn. The veteran Brazilian is down in 12th position following his switch to Williams, but hopes to secure his first podium finish of the season this weekend. "I have great memories of Valencia. I won the race there last year, it was my 10th [career] win so it was great fun," he told Formula One's official website. "The challenge in Valencia is to get into Q3 and score some points." Michael Schumacher, who lies ninth overall in his comeback season with Mercedes, is set to make his Valencia debut this week. He won the event five times at its pre-2008 home in his native Germany and once at another Spain circuit in Jerez in 1994. The seven-time world champion has yet to win a race since returning from retirement, but is confident he can adapt to the demanding street circuit. "Valencia is a track which I have never raced on before, so it will be another new experience for me but one which I am very much looking forward to," he told reporters. "I always have been quite good in adapting quickly to new situations and I strongly expect that to be the case in Valencia."